I hate to admit it, but I really am not a fruit of veggie eater. I've always been a picky eater and just have not found one fruit or veggie that I really like (except corn.) As I'm getting older, I'm realizing that I need fruits and veggies in my diet in order to stay healthy and help keep my body going. 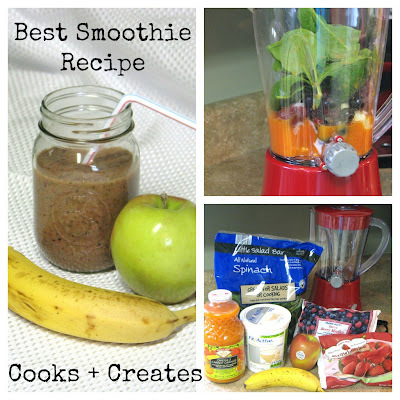 Here's my smoothie recipe that I have everyday - I love it! 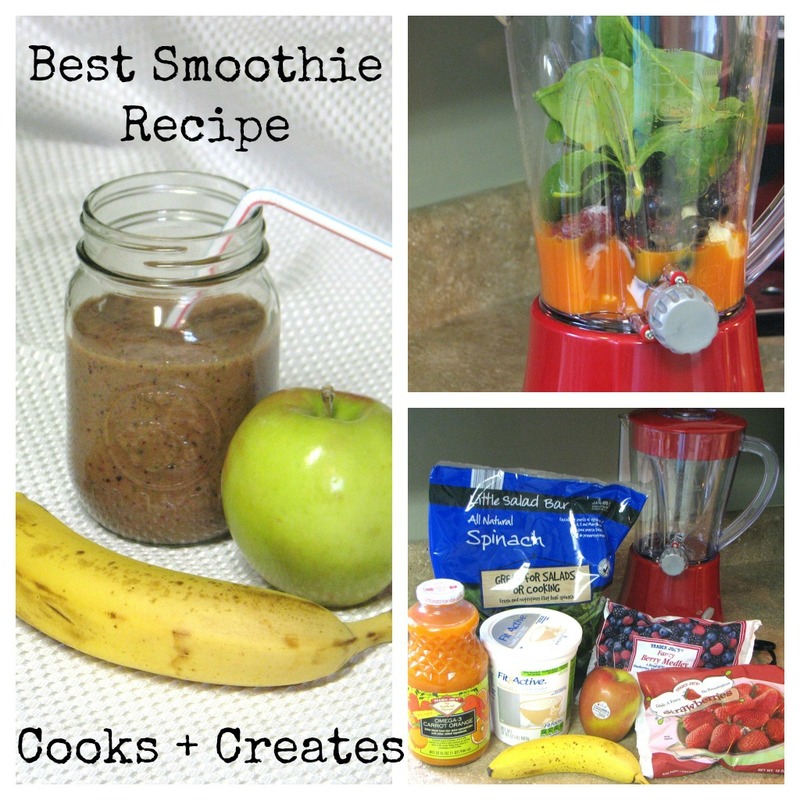 Even though both of my kids love fruits - they don't eat near enough of the green stuff, so this smoothie has some good stuff in there for them too. Smoothies are also a great way to help weight loss. We all know that in order to lose weight, we need to eat better. Most of us don't eat enough fruits and veggies and smoothies are a perfect way to get what your body needs and help fill you up too! Core and peel your apple. I normally only put in half the apple and feed the other half to the kids for lunch. Add two heaping tablespoons of yogurt. Add your berries. You can use whatever type of berries you have on hand, or happen to be on sale. I like this mixture for all the antioxidants these berries have! Throw in a handful of spinach. Pour in about a cup and a half of your juice. If you like a thicker smoothie, add only a cup. If you like yours a bit thinner go for about a cup and 3/4. Blend away! If you have kind of a crappy blender like I do, you might have to stop it several times and take a spoon and jam all the frozen stuff down to the bottom. That way everything gets blended! Pour and serve with a straw! These smoothies don't have the most appealing color (spinach) but they are so, so good. Like I said before - my whole family of meat-eaters love this one! Any and all green veggies that you wouldn't normally eat - you won't even taste them with all the great fruit in this smoothie! There you have it - a great smoothie the whole family will love! I drink these every morning for breakfast and occasionally as a later afternoon snack if I'm in the mood for something sweet! Thanks so much for stopping by! Have a Happy New Years! You can make smoothies ahead of time and freeze them too! Makes it easy! Thanks for stopping by! I really need to try these out! I don't think I ever follow a recipe for a smoothie except when I make GGS (Glowing Green Smoothie). Both my daughter and my husband say I don't make it right if I don't follow the exact recipe. Whatever! We make smoothies so we can eat all the leftover fruits and veggies, not to show our culinary expertise, right? Thanks for sharing your blend. We're mainly vegetable eaters here so I love adding spinach to smoothies. I haven't heard of the Glowing Green Smoothie - I'll have to look that one up! Thanks for stopping by! Samantha - It looks delicious! I just started making smoothies for breakfast and love spinach and even kale mixed with the fruit! I'm pinning it! I've thought about adding Kale too! Thanks so much for stopping by! I had never ate spinach before having it in this smoothie! Now I get (close to) my daily fill of green veggies! Sounds great! I never thought to throw veggies in my smoothie-thanks for the tip! Stopping by from Stone Gable! Really,I appreciate for providing the great info in this website that to using the nice info in this blog. I definitely loved every little bit of it.